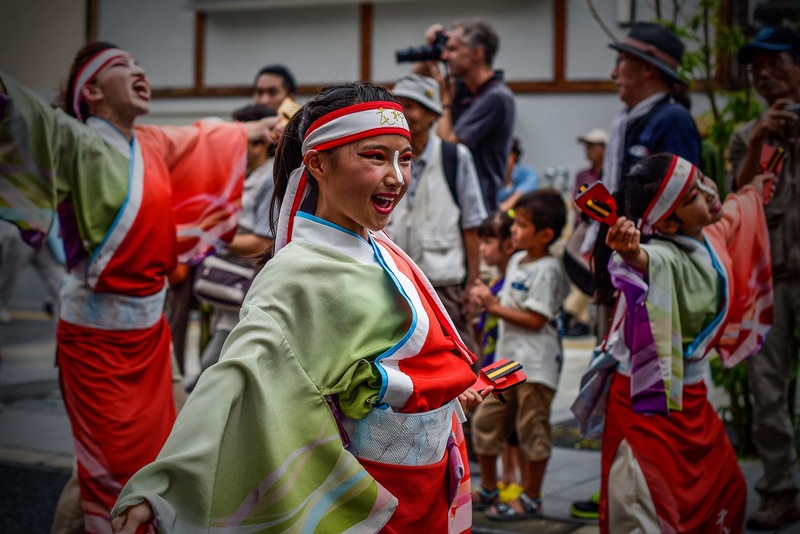 There’s many Japanese truisms but none more concrete than one we are living today, the four T’s of Japanese tourism: Travel, trains, towns and temples. Our time in Japan thus far has seen us living on the edge, but not in an adrenaline junkie sense; the question that lives heavy in the air of every waking moment is undoubtedly: Can we see just one more temple. Do we want to? Our plunge into Asia has seen a great change in the faith landscape; from Latin America’s blind faith in Catholicism to Africa’s possibly even more insidious twisting of the pseudo Christian cash cow concept, our last five months have been immersed in the far more difficult to dismiss tenets of Buddhism. While Japan has a strong Buddhist history there’s another kid on the faith block with Shinto shrines occupying much of the landscape. On the train to the old capital of Nara the question remains a fait accompli, there’s to be no avoiding temples today. We all know that Tokyo is the capital of Japan, some of us know that this is the case largely due to the Tokugawa clans rule from 1603-1868 moving the seat of power from the former capital Kyoto. What few know however is that from 710-784 the capital was in fact Heijokyo, the ancient city where current day Nara now stands. 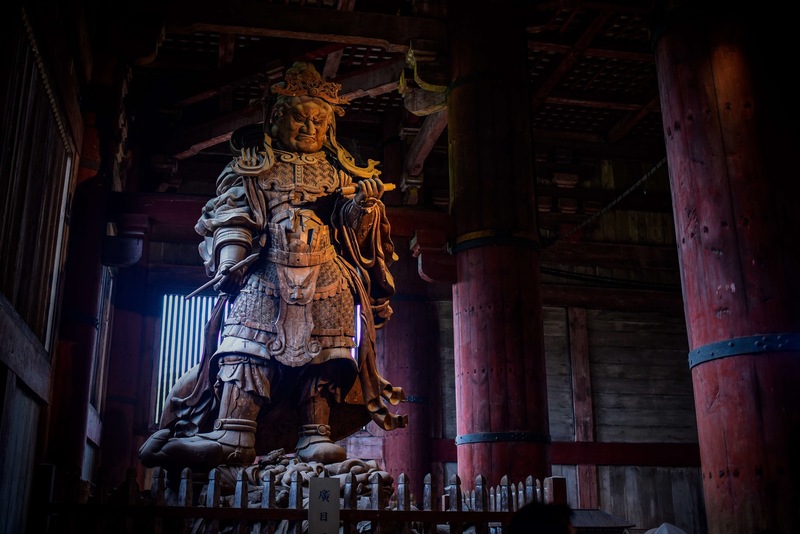 Housing the first Buddhist temple in Japan, the worlds largest timber structure and an undisturbed forest dating to the year 841, modern day Nara abuts a world from a time before this small nation perceived the light of the rising sun shining on the whole world. Great oaks from little acorns grow, goes the saying; through the modern streets of Nara a paved road signals our step into a cluster of eight UNESCO world heritage sights. The acorn of the eighth century awaits. Guardian, all 10m high and made completely from wood. Nara, Japan. To the east of Nara city our life changes colour, no longer does concrete grey, bitumen black and metallic steel surround us as an iridescent green from centuries past persists as if in a capsule. Vibrant moss covers stones like an authenticity seal confirming their unmoved position over the centuries to donate a green that seems too green to be natural. Black darker than ink reflects our view from the inquisitive eyes of deer who stroll the streets not yet scorched of life by human occupation. And of course timber in shades of brown through to silver replace the cool aloofness of concrete that refutes any accusation of personality. Heijokyo may be a little acorn in it’s position along the timeline of greatness of Japan but diminutive scale was not the forte of the powerful forebears of this great nation. Reaching to the sky to a height higher than I can hazard a guess at, a timber gate houses timber guardians surely more than 10m tall with none of the simple suggestive forms that great sculpture often adopts: these warriors are ready to jump down from their imposing perches to defy what our eyes tell us. It seems that Heijokyo’s ambition was not limited to scale alone, surely these are the most detailed and elaborate artworks of this size anywhere, ever. But a great gate that captivates our eye can only be a precursor to a great temple, and so it is for Daibatsuden. 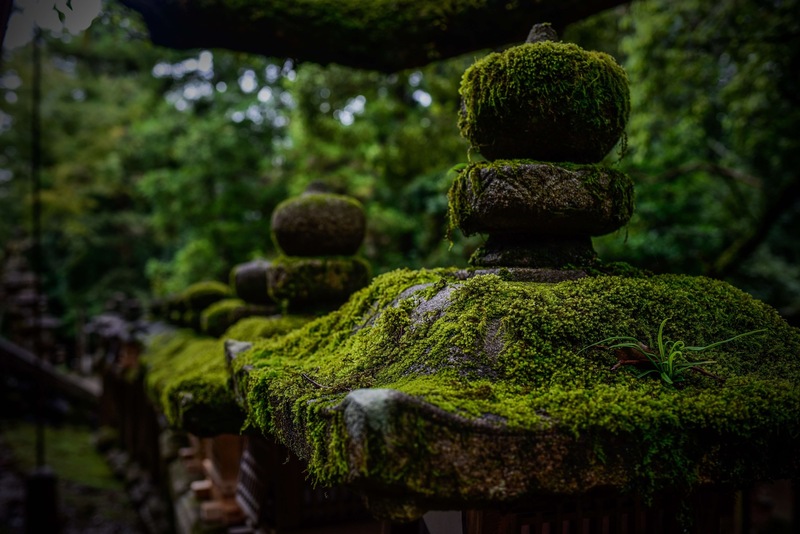 Moss covered stone lanterns, lining the paths to the multiple Shinto shrines in Nara. Japan. We’ve seen big buddhas but this one is the cherry, even grander than the staggering reclining buddha in Wat Pho, Bangkok. As staggering as the Buddha itself is, the building housing it is all the more so for its scale; sometimes there’s no amount of elegance or grace that can override sheer size. Then there’s places that sacrifice none of that elegance or grace in their size. Living in a permanent state of being ‘templed out’, any thoughts of dismissing Daibatsuden as just another temple are cast aside just as the water of this rainy day is cast over the rolling edges of the roof high above, to disperse to raindrops as if falling from the sky for a second time. The scale is breathtaking and the notion that this structure is a rebuild at just two thirds the size of the original is a waiting unfathomable headache like trying to understand what a wormhole really is. Templed out? possibly, but not today. The odd quirk of visiting Nara is that you don’t really visit Nara; it’s the acorn of Heijokyo we now find ourselves in the midst of, the grand ambition planted in the soil here to feed this moss covered world and wrap us up in a life so foreign. There’s no modern world on which we stand to cast our eyes out to a wonder reduced to an attraction, just stone lanterns by the thousands, steps that saw the rise and fall of Emperors and Empresses and a world that touches the sky from a little acorn that thought big. It’s in this immersion that we venture, into air that’s cooler and wetter in this seat of great power that even forces of nature seem to bow and take their leave from. Dancers in elaborate costumes, Nara, Japan. There’s temples all around but it’s a world that invigorates rather than tires, taking one single stone lantern from the endless promenades would be the treasure of our garden but line up like fenceposts here. Countless stairs to intriguing spaces remove the everyday feeling that often makes temples stand out as so different; in truth the temple idea here isn’t defined to a building, a shrine, an oversized bell or a treasured garden, it’s by definition indefinite. Shinto and Buddhist beliefs collude with a somewhat pagan ethos to create a world where a natural temple is the temple we all come to see, in every tree, stone and drop of water that trickles all around. Maybe we’ve been doing it wrong all this time, viewing temples rather than being wrapped within them. Or maybe centuries have picked the flesh from great places leaving just a few scant remains to call us back to a former glory. In the destruction of cultures the world over, great civilisations remain only as relics, but in Heijokyo an unbroken line lies to the little acorn that grows still; all the way to Tokyo and beyond. Still we count the procession of grand stone lanterns that almost define this place, under the sacred bows of a primeval forest undisturbed for over a thousand years and just the few more steps into modern day Nara. There’s a festival of sorts on today, dancers in elaborate costumes perform on the street just metres from a world that feels so far away, or at least it should; or shouldn’t. Far from being pushed behind security fences or severed from the validity of life that exists outside of the advertised opening hours, Heijokyo exists not as a relic or a reminder but a pulsing life that feeds beyond it’s roots still to this day. Be they evil deeds or great influences, Japan has cast the light of the rising sun across the world, all from the little acorn with big ambitions and one too many stone lanterns covered in moss. once again your images and stories are amazing.